Behold! 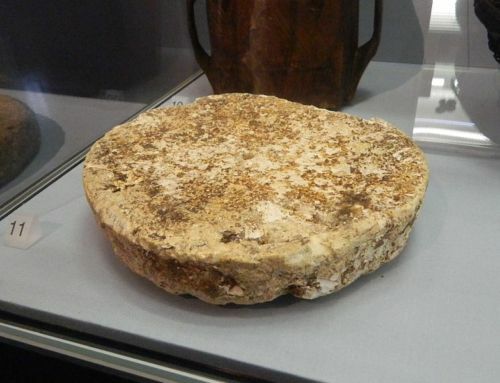 A 2,000 Year-Old Mound of Butter! Home > Food News > Behold! A 2,000 Year-Old Mound of Butter! It weights roughly 22 pounds and is over two thousand years old. It is bigger than a football. It is a lump of butter from antiquity, and it is still edible. Although this is far from the first time that ancient and forgotten butter deposits have been uncovered, this new find possesses certain anomalies that suggest this particular dairy dish is uniquely spiritual in nature. The butter was found in a peat bog in Ireland on June 1 by a farmer named Jack Conway. Conway was cutting turf for fuel when he found the large mound buried about 16 feet below the surface of the bog. Such discoveries are known as “bog butter” and are not unheard of among Irish turf cutters. Peat bogs are a cold, acidic environment with low levels of oxygen, making them highly effective at preserving organic matter. In this particular case, the lump was dated at being a minimum of two thousand years-old based on analysis of the foliage surrounding the discovery. Despite being called “butter”, these waxy finds are not always dairy products. Some masses are actually made of animal fat or meat, though some are also mixtures of meat and dairy butter as well. The exact reason for these burials is not fully understood but the leading theories are that the bogs may have been used to help preserve food, to engage in some form of primitive food processing, or a combination of the two. One notable difference between most bog butter finds and this most recent discovery is that the butter Conway found appeared to lack any form of container. Normally, bog butter is found in a wooden keg or cask of some sort, which was the typical practice for storage. The lack of a storage medium suggests that whoever buried the butter did not intend to retrieve it. Since butter was very valuable and seen as a luxury in ancient times, it has been theorized that this mound was left as a religious offering. The bog butter still smells quite strong despite its age and is likely still edible, though it is highly advisable that people not attempt to eat it. Those who have tasted modern recreations, however, describe the taste as gamey, mossy, funky, pungent, and “salami”. Daley, J., “A Brief History of Bog Butter,” Smithsonian web site, June 13, 2016; http://www.smithsonianmag.com/smart-news/a-brief-history-of-bog-butter-180959384/?no-ist, last accessed June 15, 2016. Feature image: By Bazonka (Own work) [CC BY-SA 3.0 (http://creativecommons.org/licenses/by-sa/3.0)], via Wikimedia Commons; https://commons.wikimedia.org/wiki/File%3ABog_butter_-_Ulster_Museum.JPG.